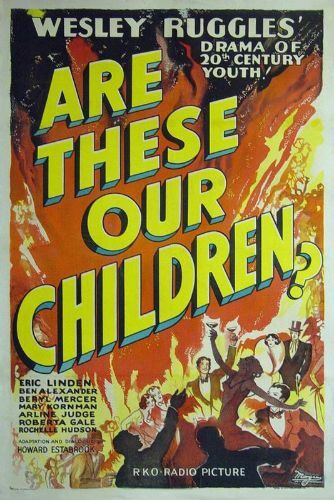 Eternal movie juvenile Eric Linden offers perhaps the best performance of his career in RKO's Are These Our Children? In this pioneering Juvenile Delinquent drama, Linden plays a know-it-all high school dropout who falls in with a bad crowd. While burglarizing the delicatessen of a family friend (William Orlamond), Linden accidentally kills the old man. No one can connect him with the crime, and for a while Linden privately gloats as he reads newspaper stories of the killing. But one of his friends (Ben Alexander), who was in on the robbery, spills the beans, and Linden winds up going to the chair. The true impact of Are These Our Children? is Linden's performance as an emotionally immature youth who cannot fully fathom the seriousness of his dilemma: he tries to jolly himself into believing that he hasn't killed anyone, and as he sits on death row he continues displaying a childish bravado, as if expecting to wake up from a bad dream at any moment. Despite its age and the corniness of some of the dialogue, Are These Our Children? is an unforgettably powerful film.